The frequency of the mains controls the speed at which the clock runs. For this reason a clock made for the UK or Australia will not run at the correct speed in the US and vice versa. The US mains is 60Hz and UK and Australia mains runs at 50Hz - rather annoying for the clock collector. 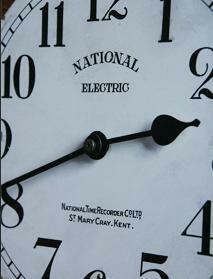 electric-clocks.co.uk has developed a frequency converter that will convert 50Hz to 60Hz and run USA clocks in the UK and Australia and other coutntires on 50Hz mains. There is also a version to run an English clock in the USA. A small circuit controlled by a crystal and micro-controller and giving either a 0.5 second , 1 second, 30 second or 60 second pulse to drive a slave clock in the absence of a Master Clock. Small enough to fit behind the clock. The controller activates the armature or rotor of the clock at the desired interval. The clock can then be powered by a battery pack located in the back of the clock or by an external wired power supply if desired. It will come as a bare board circuit, mounted or in a plastic enclosure.